Here is someone who has revolutionized science, was selfless in pursuit of the truth, overcame skepticism and outright prejudice, while maintaining a child's wonder about the universe. Rather than just learn equations from a book, this scientist thought up new equations! 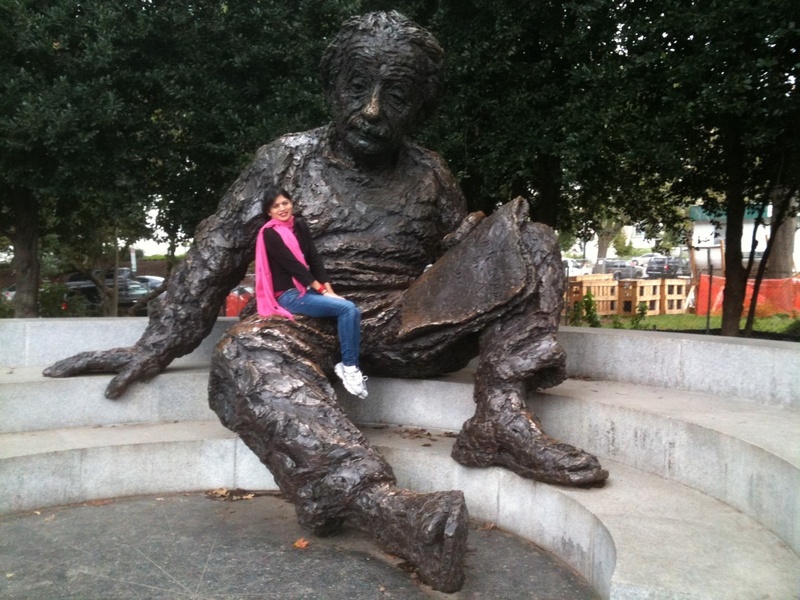 The statue of Albert Einstein sits in front of the National Academy of Sciences in Washington. The sculptor, Robert Berks, gave Einstein a notebook with three of his famous equations. The most famous Einstein equation, equating energy with mass. It was published as a quick addendum to one of his 1905 papers. Einstein published 4 revolutionary papers in a short time. The world took years to realize their significance. Today E=mc^2 is ubiquitous, even to those who don't understand what it means. The photoelectric effect, which Einstein explained using quantum mechanics. This probably got the attention of Annalen der Physik editor Max Planck, one of the founders of quantum mechanics. There was no system of "peer review" in 1905; publication of papers was solely the decision of editors like Planck. If not for Planck, Einstein might have waited indefinitely to be published. Einstein's solution to the photoelectric effect was the official reason for his 1921 Nobel Prize, for even in 1921 Relativity was controversial. The Einstein equation for gravitation, part of his General Theory of Relativity published in 1915. General Relativity predicted that gravity is actually a curvature of Space/Time. Einstein tried to apply this curvature to the entire universe, imagining it as a sphere of four dimensions rather than 3. We move in the 3-D surface of the sphere. Photons travel like satellites in orbit around the sphere with velocity c.
Einstein realized that the gravity which causes Space to be curved into a sphere would also cause it to collapse, unless it were expanding. Einstein could have predicted an expanding universe, which would have been one of history's great scientific predictions. Certainly the prediction would have been ridiculed at first. 15 years later Edwin Hubble's observations would show that the universe was indeed expanding. To support his spherical Space/Time, Einstein added a repulsive "cosmological constant" to the equation. When Hubble showed that the universe was expanding, Einstein removed the constant. Later Einstein would call the CC his greatest blunder. Recently it has been fashionable to add the repulsive constant again. So far, Einstein has still not been convinced. His notebook shows that there is no cosmological constant. We can learn a lot from Einstein. 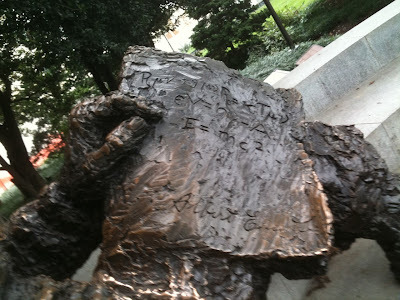 The very formulation of original equations is proof of his unusual mind. Finding equations that made testable predictions made Einstein even more special. We learn that even Nobel Prize winners make blunders. The inclusion of a cosmological constant also hides another prediction, that the speed of light c is not always constant. NEXT: We visit another Nobel Prize Winner.